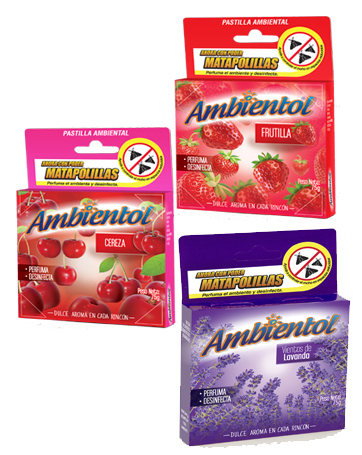 Perfumes and disinfects the whole environment, covers an area of ​​9m2, in larger spaces, to achieve the same effect, it is recommended to use more than one pill. Lasts up to 50 days approximately, leaves no stains. Remove the cellophane from the pill, insert it back into the box and place it where you want to have a pleasant aroma. Cherry,Strawberry, Apple,Potpourri, Lavender breeze, Apple Cinnamon, Jasmine fields. Disinfectant disc that kills germs with a potent germicidal action and perfums the atmosphere, comes with a single plastic fastener. Does not stain the toilet. Lasts up to 20 days and leaves no stains. Remove the cellophane from the tablet, place it on the hook and hang it in the toilet bowl. 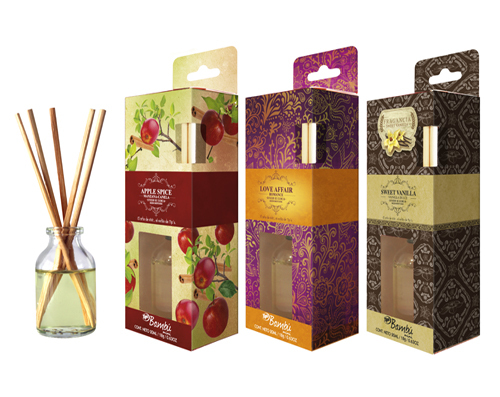 Perfume your entire home with a pleasant aroma. Press the trigger to the center of the room. 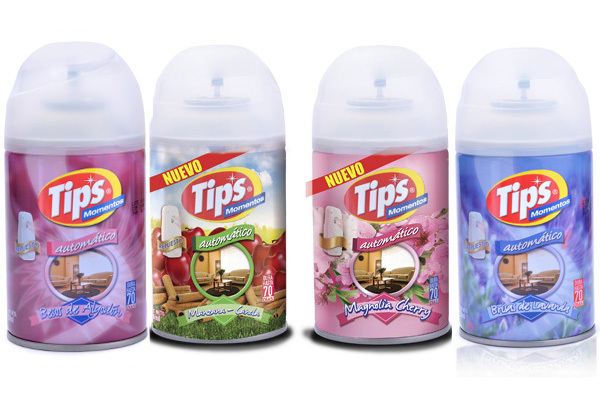 Tip's Conéctame electric air freshener is specially designed to bring new sensations to every room of your home, it releases fragrances that last for days. Thanks to its modern and sleek design, it allows you to adjust the intensity level of your favorite fragrance and harmonize it with the decor of your home. Carefully unscrew the cap of the bottle with fragrance. Insert the bottle into the fragrance vaporizer until it clicks. Connect the vaporizer vertically in a 110-volt outlet. Turn the plug if necessary before connecting. Replacement x1 - 24 Unds. Replacement x2 - 12 Unds. dispenser + Replacement x1 - 12 Unds. 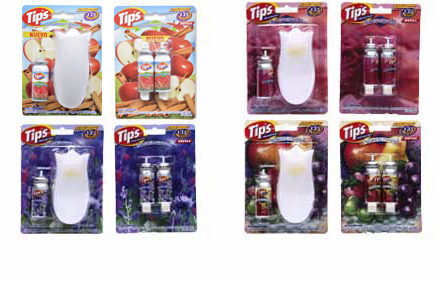 It is a water-based anti-odor freshener made with natural fragrances that encapsulates and eliminates odors. 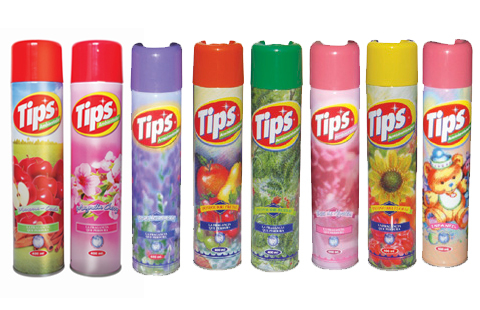 Excellent for parfuming all areas of the home, surfaces, fabrics, curtains, furniture, beds and carpets. Remove the atomizer’s safety lock. Press the atomizer to release the aroma. It is specialized to combat bad odors caused by cigarettes and pets. 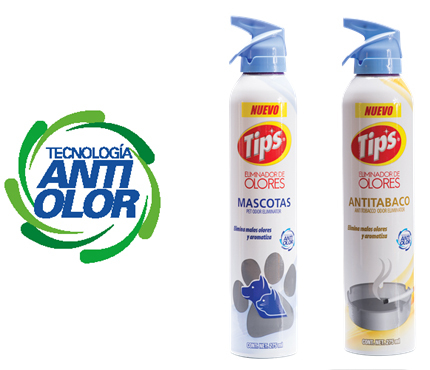 Their anti odor encapsulating technology eliminates odors. 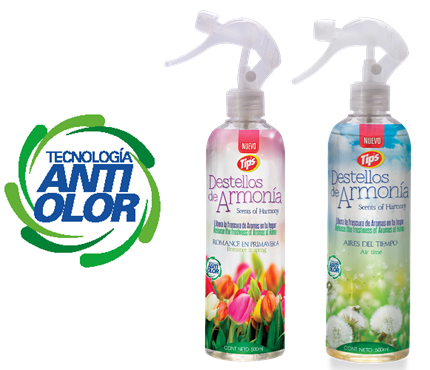 It keeps every environment always fragrant and fresh thanks to its delicate aroma. It can be used in environments such as kitchens, bathrooms, bedrooms, living rooms, study romos, etc. Press the atomizer and spray into the air or surfaces. 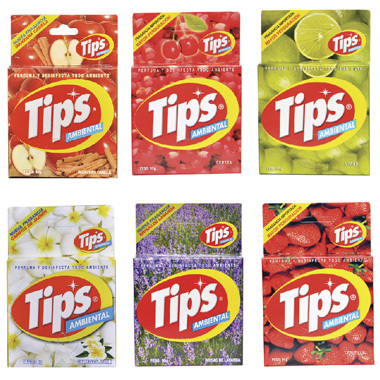 Tip's Automatic moments diffuser is specially designed to acclimate your home automatically with your favorite fragrances. It can be sprayed in intervals of 9, 18 and 36 minutes to keep your home fresh. The diffuser has an elegant and decorative design, ideal to place it in any room (bedroom, living room, etc.) on a flat surface, or hang it on a wall. After placing Tip's Moments on the device, the diffuser will automatically release your favorite fragrance keeping the interval you select. 1 Automatic Diffuser + 2 batteries included. Enjoy the fragances and keep the environments that surround always perfumed with its pleasant fragrance for up to 70 days. 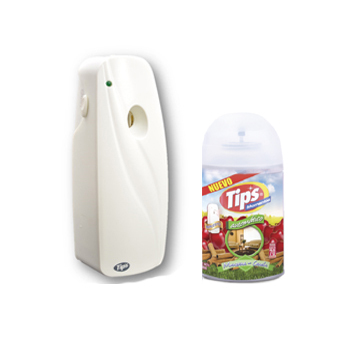 Works with Tip's®, Air Wick® FRESHMATIC®, Lysol® and other dispensers. 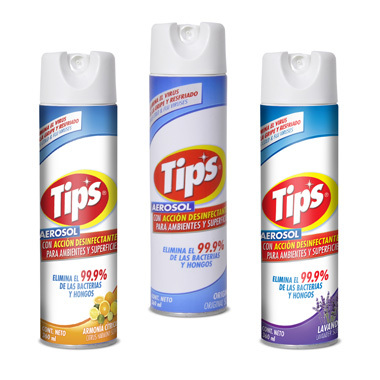 Air Wick® FRESHMATIC® and Lysol® are registered trademarks of Reckitt Benckiser Inc., Tip's® is a registered trademark of Calbaq. It can be used manually in a vertical position, or automatically, placing the parts inside the dispenser with the off switch, then programming the dispenser according to your needs. It is a modern air freshener. A single click is enough to freshen and also remove odors from any environment. 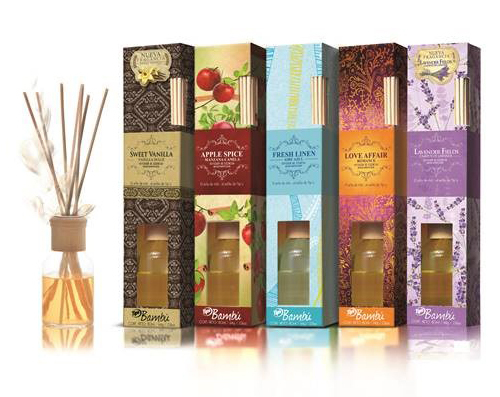 Experience the serenity emanating from these fragrances. A pleasant and splendid evocation of life that allows you to enter into a relaxing oasis. Remove the cover and protection cap from the glass bottle and place the decorative cover. Place the container in a safe place (where it is in no danger of tipping over). Introduce bamboo sticks in the fragrance bottle to imprégnate them. For more aroma in the environment, it is recommended to turn the bamboo wands. They will help you enjoy the aroma. Aromatize your environments and decorate the space where you use it.Perfect for small areas like: Bathrooms, closets, bedrooms, offices, kitchens and more places. Ideal as a gift. Remove the protective cap from the glass bottle. Place the container in a safe place (where it is not turned). Insert the bamboo wands into the bottle to impregnate it with fragrance. If you want greater fragrance in the environment, it is recommended to flip bamboo wands frequently. 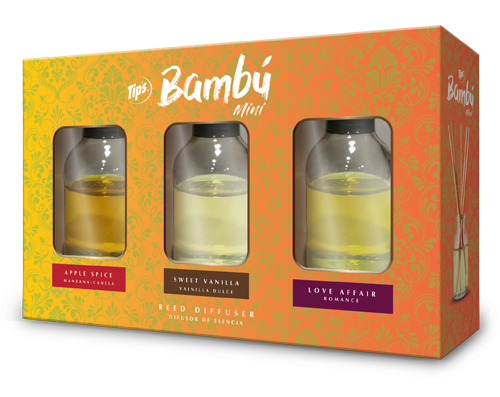 Tip`s Bambú brings you your favorite fragrances in a single package. This ideal gift presentation will fill every corner of your home with exquisite fragrances and decorate your environment. Perfect for small spaces such as bathrooms, closets, bedrooms, offices, kitchens and more. 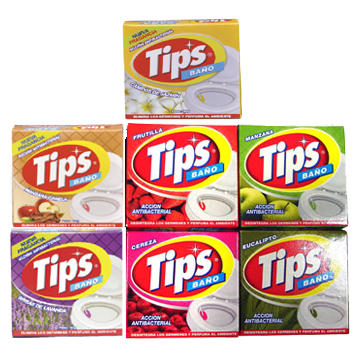 Tip’s candles have good fragrances, pretty colors and attractive packaging, and are a perfect addition to the decor of any room. It is an air freshening disc that disinfects the environment, made from paradichlorobenzene. A tablet covers about 9 m2. Remove the cellophane from the disc, insert it back into the box and place it where you want to have a pleasant aroma. It is recommended to use more than one in large venues. Cherry, strawberry, winds of lavender. Kills 99.9% of bacteria, disinfects and deodorizes, removes the flu and cold virus, whitens clothes, disinfects water and more. 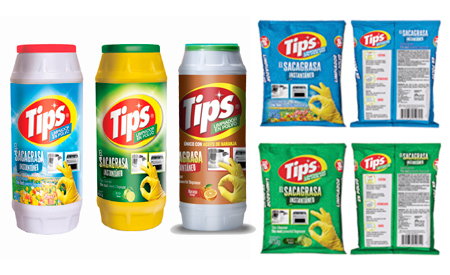 With ergonomic grooves that allow a better grip and prevents the bottle from slipping and falling to the floor. 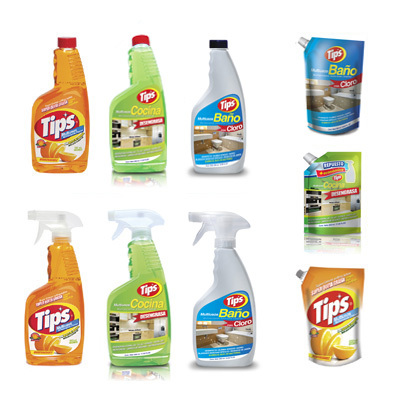 Cleans and disinfects floors, bathrooms, kitchens, walls and tanks. Dilute 240cm³ (1 cup) Tip's Chloro in 4 liters of water, apply in the area to be cleaned, let stand for 5 minutes and dry. It can also be applied directly. Place 240cm³ (1 cup) Tip's Chloro inside the toilet, scrub with a brush, let set for 10 minutes and flush. 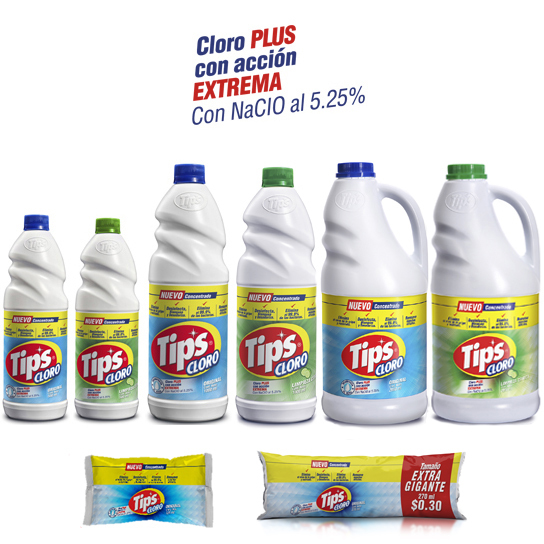 Dilute 120cm³ (1/2 cup) Tip's Chloro in 8 liters of water, soak the garment for 5 minutes, rinse and wash as usual. 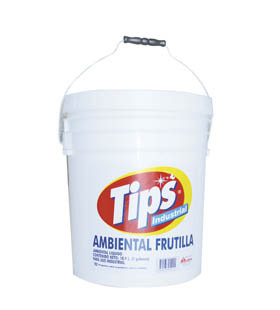 Dilute 5cm³ (1 tsp) of Tip's Chloro in 10 liters of water, pour the fruits and vegetables for 2 minutes, drain and let dry. 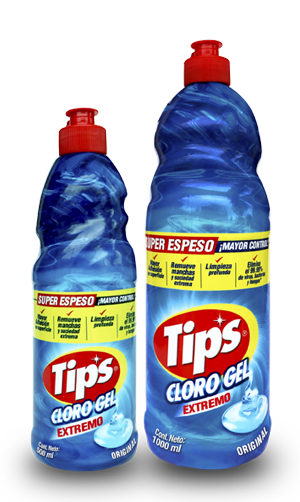 Tip’s Cloro GEL - EXTREME, It's SUPER THICK formula allows GREATER CONTROL!, does not splash. Removes stains and extreme dirt. 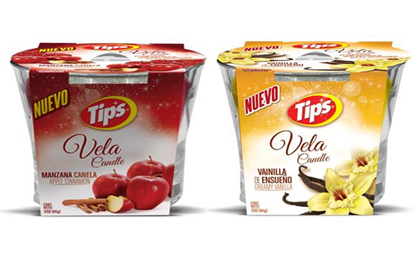 With Flip-Top lid facilitates surface adhesion. Eliminates 99.99% of viruses, bacteria and fungi. It can be used in bathrooms, showers, floors, kitchen, laundry. Sodium Bicarbonate disinfects, deodorizes and cleans floors, kitchens, bathrooms and laundry. 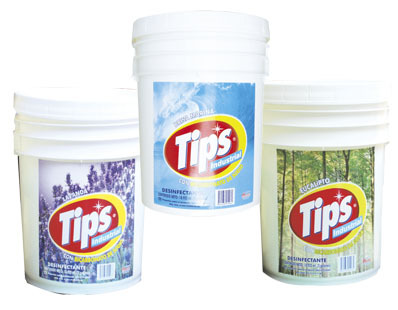 The powerful benzalkonium chloride germicidal action of Tip's destroys germs and bacteria causing odors and diseases. Diluted in water to form a strong detergent solution, it easily removes stubborn dirt. The tablet is immersed in the toilet tank and provides cleaning, disinfection, fragrance and color to the water. 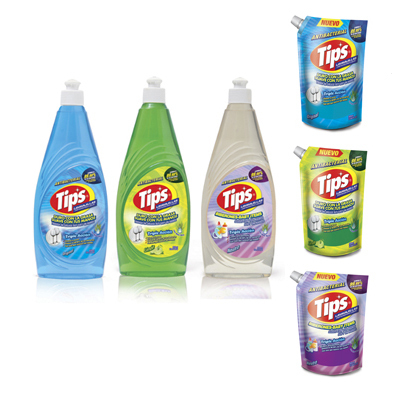 Ultra strong leaning concentrate, long-lasting, deodorizes and prevents stains. Its unique prolonged fragrance lasts for up to 6 weeks or 45 days, and does not damage the pipes, leaves no residue or stain. Remove the disc from the pack, do not remove the sheath as the tablet dissolves with wáter. Place the disc into the tank opposite the water supply. Initially, wait 10 min, before flushing. When the color of the water disappears, it is a sign that you need to replace the disc. Eliminates the cold and flu virus. Kills 99.9% of bacteria, viruses and fungi. Use it to disinfect: bathrooms, bedrooms, dustbins, phones, mattresses, toys, pet areas, pillows, romos of sick people, countertops, carpets, etc. Kills germs in your home in 10 minutes: Escherichia coli, Salmonella, Klesbiella, Staphylococcus Aureus, mold, Influenza A virus, Adenovirus, among others. Clean the surface before use, shake the product, spray surfaces from a distance of 15 to 20 cm to cover them with a thin layer. New product line for each area of ​​the home. Bathroom: Helps clean and disinfect all bathroom surfaces such as floors, tubs, showers, sinks, leaving them with a fresh scent. 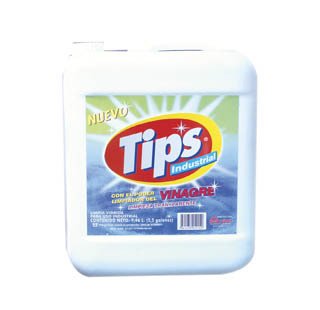 Its powerful formula is ideal for removing black spots between the tiles. 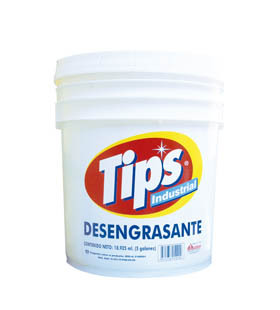 Kitchen: This solution is a good degreaser that does not irritate the skin. It also works on any surface such as ovens, countertops, stoves, and the entire kitchen. Orange: Orange Tips Multipurpose, with its revolutionary technology, attacks, separates and dissolves dirt and grease quickly leaving a fresh orange scent. 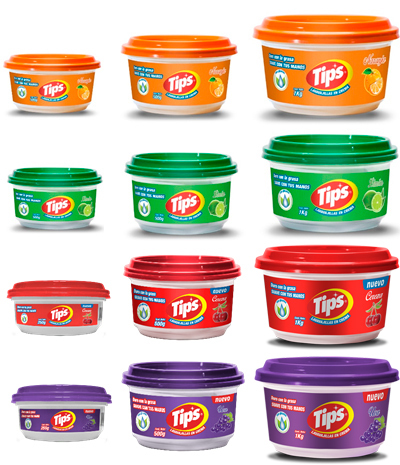 It is used to fill any plastic container. 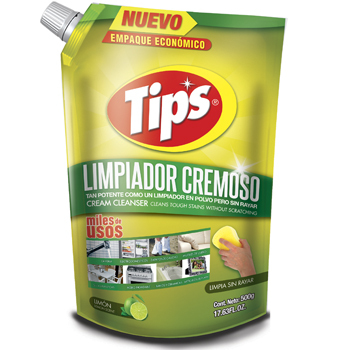 Tip's Creamy Cleanser is powerful as a cleaning powder but without scratching. It has thousands of uses! It cleans taps, appliances, bathrooms, ceramic, stainless steel surfaces, silver, etc. Apply a small amount directly on the treated surface with a cloth or damp sponge. Keep container closed after use. Offers thorough cleaning, removes tartar and kills germs from the toilet. 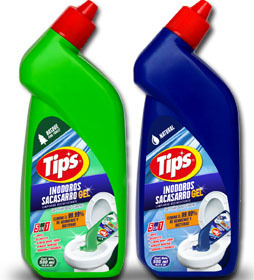 The shape of the container facilitates the application on the edge of the toilet bowl. Liquid cleaner with ammonia, cleans quickly and easily. 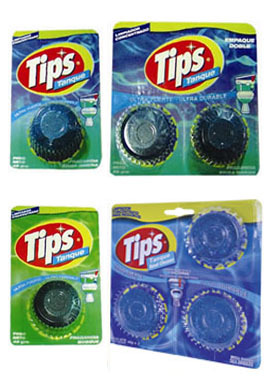 Removes all types of dirt on glasses and washable surfaces without scratching. Dries quickly. Cleans and polishes with a single rub. It is a dishwasher in cream with biodegradable formula and degreasing power. Its vertical potting practice does not allow water and waste to accumulate, preventing the proliferation of bacteria resulting in a longer product life. It has extracts of oats and almonds that take care of your hands. 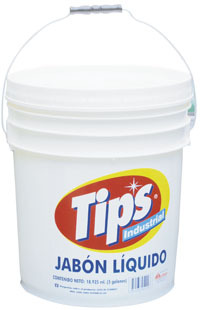 In a damp sponge spread tip's dishwashers in cream 60º. Apply to the surface with grease, then rinse and allow to drain. With Aloe Vera that softens your hands. Its neutral presentation is special for baby bottles, pacifiers and other elemens used by babies. 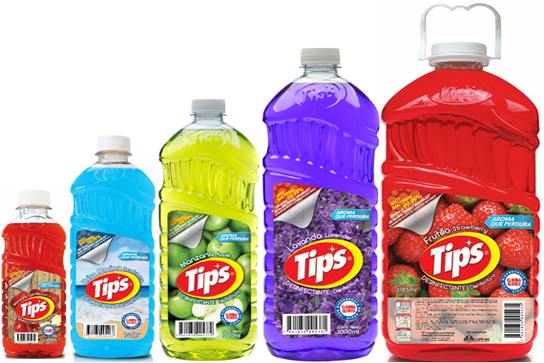 Pour a few drops of Tip's liquid Antibacterial Dishwasher in a container with water and soak the sponge to moisten, then proceed to wash the dishes and glassware. For difficult dirty, apply the liquid directly on sponge or cloth and wash. 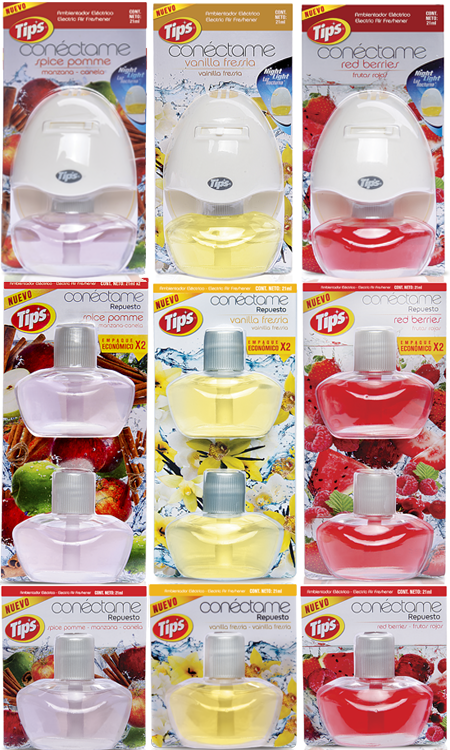 It serves to fill any plastic dishwashing liquid container. Instantly removes grease from kitchen countertops, kitchen utensils and other surfaces. The components of this product exert a cleaning action on hard surfaces that have dirt and accumulation of greasy elements, leaving them instantly clean, free of grease and with a pleasant clean smell. Pour on the surface to clean a sufficient amount, rub it with an abrasive sponge for a few minutes and then rinse, the result will be instantaneous. Its NEW FORMULA contains properties that help eliminate bad odors, specializing in cleaning fruit vegetables and household utensils. Floors, microwaves, refrigerators, stoves, cutting board, silverware, stainless steel and porcelain. CLEANING OF FRUITS AND VEGETABLES. Industrial disinfectants for all types of surfaces. Dissolve 1 liter in 1 liter of water. Dissolve 1 liter in 5 liters of water. All kinds of areas that you want to keep with a good aroma. 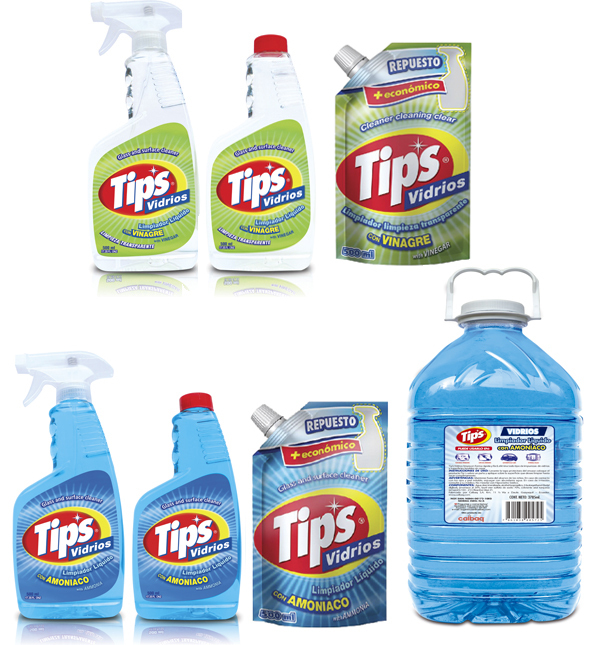 Disinfectants in industrial sizes and formulas. Dissolve 1 liter in 20 liters of water. Eucalyptus, sea breeze and lavender. Floors in external and internal areas.